If this card is Normal or Special Summoned: You can target 1 monster on the field; destroy it. Cannot be targeted by an opponent’s card effects. If this card is destroyed by battle or card effect and sent to the Graveyard: You can banish this card from your Graveyard; Special Summon 1 Level 7 or lower “Kozmo” monster from your Deck. Kozmo Dark Destroyer is still great. Now 2 are available to the TCG. It’s still a Level 8 Dark Machine-type monster with 3000 Atk and 1800 Def. Those are great stats just to throw into decks using Allure or Trade-In. It gets an effect to destroy any face-up targeted monster when Normal or Special Summoned. If it is destroyed and sent to the grave, perhaps by its own effect or Limiter Removal, or anything your opponent uses, it Special Summons any Level 7 or lower Kozmo Monster from the deck at the cost of banishing the newly destroyed Dark Destroyer. Don’t sleep on Kozmo. They will survive any format because they do not need the Extra Deck. Dark Destroyer in particular has strength and versatility and a lot of utility in its own deck. Looks awesome too. Happy Friday! 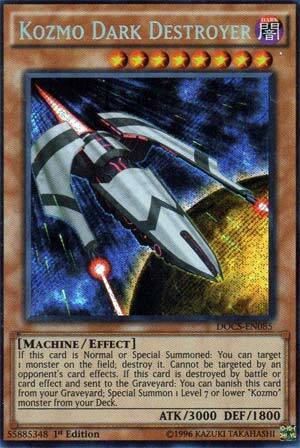 Dark Destroyer is a Level 8 DARK Machine with 3000 ATK and 1800 DEF. ATK is amazing, DEF is ok, DARK and Machine are amazing with Allure of Darkness and the newly Semi-Limited Limiter Removal. If Dark Destroyer is Normal or Special Summoned, you can target 1 monster on the field and destroy it. Anyone that knows Kozmo knows that all the smaller monsters in the deck are pilots for the big ships of the deck, and Dark Destroyer was one of the best ships to destroy an opponent’s monster or destroy another one of your ships because when the ships are destroyed, they can banish themselves from the GY to summon a Kozmo with a Level up to the Level the ship had minus one, and this includes Dark Destroyer, as when it is destroyed and sent to the GY, you can banish it to summon a Level 7 or lower Kozmo from the deck. The only ships that are not like this are Dark Eclipser and Dark Planet, which search upon destruction instead. The destruction of Dark Destroyer plus the floating of all the ships made for easy OTKs in the deck, and it gets much easier with two Dark Destroyer. For some icing on the cake, this card cannot be targeted by your opponent’s card effects, which can get annoying to them with 3000 ATK staring your them down. Thankfully you can target it with another Dark Destroyer to float after it attacks. Dark Destroyer is a card you max out on in the Kozmo deck, which is now two and might be three soon just like in the OCG. Art: 4/5 I’d like to fly this ship, to be honest… if I could fly a ship. So, for starters, when Normal or Special Summoned, you get to Target a Monster on the Field and destroy it. Being Level 8, you probably/hopefully Special Summoned this, which ends up being a +1 for you, as you brought out a Monster of your own and then got to destroy one belonging to your opponent (though you may have destroyed something of your own, as does actually greatly assist the Kozmo theme) helping you bring out something bigger and better. The situation depends, you will gain advantage here either way. If sent to the Graveyard when destroyed by Battle OR Card Effect, you can remove this card from play to Special Summon a Level 7 or lower Kozmo Monster from your Deck. It’s always the Level below what was destroyed, and it’s great that it gives you an option as to how. Just remember it has to go to the Graveyard, so you get nothing if it gets removed from play instead.